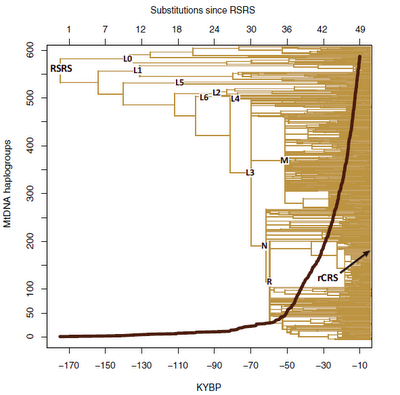 The Cambridge Reference Sequence is dead, long live the RSRS! Let's hope for a smooth transition. The supplement (the paper itself is open access). Table S5 within the supplement is very interesting, as it contains age estimates for the nodes of the new mtDNA phylogeny, and places the common mtDNA ancestor of humans (represented by the new reference sequence) at ~177,000 years. The age of L3 (~67,000 years) is a useful sanity check of the time depth estimates, and it corresponds with the onset of Marine Isotope Stage 4. Another useful check is for that of haplogroup H (~13,000 years), consistent with a late Paleolithic origin and Neolithic expansion of this haplogroup. The two main Eurasian macrohaplogroups M (~50,000 years) and N (~59,000 years) also appear appropriately dated on the cusp of the major Paleolithic expansion of humans across Eurasia. The higher age of N may indeed correspond to an earlier split (this haplogroup is shared by all Eurasians), whereas M has a more contained distribution (largely lacking in West Eurasians), and may have spread later. The age of haplogroup U (~47,000 years), which is the oldest West Eurasian lineage also seems to correspond appropriately to the arrival of the earliest modern humans in Europe. Mutational events along the human mtDNA phylogeny are traditionally identified relative to the revised Cambridge Reference Sequence, a contemporary European sequence published in 1981. This historical choice is a continuous source of inconsistencies, misinterpretations, and errors in medical, forensic, and population genetic studies. Here, after having refined the human mtDNA phylogeny to an unprecedented level by adding information from 8,216 modern mitogenomes, we propose switching the reference to a Reconstructed Sapiens Reference Sequence, which was identified by considering all available mitogenomes from Homo neanderthalensis. This “Copernican” reassessment of the human mtDNA tree from its deepest root should resolve previous problems and will have a substantial practical and educational influence on the scientific and public perception of human evolution by clarifying the core principles of common ancestry for extant descendants. 177,000 for a common mtDNA ancestor is a younger estimate than it used to be. But it still would make Bushmen and Pygmies who have the "basal" branches at high frequencies diverge from the rest of humans 100,000 years before the emergence of signs of modern human behavior globally. It means they developed their language and culture independently of the rest, which is nonsense. 60,000 for the oldest non-African macrohaplogroup (N) misses the age of the fully modern Zhirendong chin in South China by 40,000 years. There must be a different explanation of those divergent African mtDNA lineages. Could be a mutation rate runup, or admixture with archaic humans in Africa. I have been conducting survey and excavation in southern Arabia for the last 15 years and can say with a relative degree of confidence that there was no post-70 ka BP migration out of Africa. The lithic technology in Arabia, from that point onward, does not resemble anything in Africa. There are clear affinities between the Nubian Complex of Northeast Africa and that of southern Arabia (~100 ka BP), but after MIS 4 it appears that the two populations were cut off and diverged in different directions. While agree with many of the points in this article, I find the authors’ complete disregard for the archaeological evidence particularly disappointing. This seems to be a growing trend, expressed by the straw man “stone tools don’t equal people.” No lithic specialist, however, makes that argument. Stone tool technology is culturally transmitted behavior akin to language. It doesn’t tell us the skeletal structure of the toolmakers, but it certainly tells us what “language” they spoke. In fact, I would argue lithic technology is the best proxy we’ve got for discerning the physical remains of demographic movements. So Dienekes, here’s an update on the Nubian Complex of Dhofar (just back from the field a few weeks ago). We’ve now got a second lithic industry that is derived from the classic Nubian Complex, but appears transitional between Middle and Upper Palaeolithic. The toolmakers seem to be moving away from the production of elongated Levallois points and toward recurrent blade manufacture using opposed platform flat cores. This is significant because it is exactly what we see in the basal layer at Boker Tachit, the key MP-UP transitional site in the southern Levant, and oldest in the world. When they found the site, the excavators questioned where this technology comes from, since it seems intrusive into the Levant. I think you can see where I’m going with this. Nubian Complex as the root of the N branch? Not sure yet how these puzzle pieces fit together, any thoughts? at what point are clear archaeological links between Asia and Africa re-established? You mention the Hargeisan in your paper, are there any later links that can be identified, or do the lithic industries in Africa and Asia continue largely independently from then on? If Nubian Complex is associated with haplogroup N, then the age estimates of this paper (and others) should be roughly doubled. Moreover, we'd have to find where haplogroup M arose, which might imply an even greater range for early H. sapiens in Eurasia. 1. Hyper-aridity during MIS4 and/or MIS2 may have largely wiped out (or severely bottlenecked) the population of Arabia, and present-day Arabians are derived largely from Neolithic-era migrants from elsewhere with minimum absorption of local elements. 2. The recent paper on ancient links between Africa and Europe has made me suspect that some of the lineages in the Near East ascribed to recent African admixture may actually be quite older there. At present, the hypothesis that mtDNA haplogroup L3 and its predecessors originated in Africa is based on the larger number of L3 descendant lineages in Africa than in Eurasia. ii. there are indeed some relic deep clades of mtDNA in Asia, which we haven't been able to detect yet. I find (ii) to be quite likely as well. Consider that the deepest clades of the mtDNA phylogeny have only been detected because San/Pygmies/etc. still exist as distinct peoples, despite their small numbers. If they had become absorbed by the African farmer juggernaut, then we'd scarcely know that they existed, unless we took really huge samples. I believe something like that may have happened in Eurasia, which had a several thousand years head start over Africa in the farming department. Potential mtDNA relics of the oldest Eurasian population of Arabia (which may have been L3 but not M and N, or even pre-L3) are only sampled as outliers (because the Eurasian equivalent of San/Pygmies _have_ been absorbed by the Eurasian equivalent of the farmer juggernaut), and are bundled together with mtDNAs of recent African contact. So, in short, I keep an open mind about what haplogroups early Eurasians had. Certainly the last paper of Behar et al. ( A “Copernican” Reassessment of the Human Mitochondrial DNA Tree from its Root, The American Journal of Human Genetics, Volume 90, Issue 4, 675-684, 6 April 2012 doi:10.1016/j.ajhg.2012.03.002) is important, but, about the problems by me raised, has given an answer? Absolutely not. This R0a1*, for which I have carried other samples from Italy, even though partial ones, doesn’t appear in the tree. The R02a, found by Achilli in the Marche and Tuscany, don’t appear, and is it the FGS of Patti Pruden (of maternal Tuscan ancestry), that labelled with the new R0a2m? The mutation indicated is A4767G whereas Patti has A4769G. Are they the same persons? Is it only a mistake? And what about the recognized R0b found in Italy by Achilli? It is the other half of the sky, which is worth all the other, mostly South Arabian, reported. Has Mr Behar answered my questions? Absolutely not. Aside from the Hargeisan, which seems confined to the coast of northern Somalia, there is no (re)connection between East Africa and southern Arabia until the Holocene. Interestingly, we had Philip Van Peer fly out this season to have a look at the Nubian assemblages, given his experience with this industry in Egypt and Sudan. He agrees with the strong connection, and suggested there might be affinities between the aforementioned Nubian-derived material and that of the Nile Valley during MIS3. This certainly seems plausible - if there is demographic exchange during the MIS 5 pluvials, why not MIS 3 as well? On the subject of haplogroup M - nothing to connect Arabia and South Asia. Maybe (emphasis on maybe) we can draw parallels between the Jebel Faya Assemblage C material and Indian MP, but you really have to squint to make the connection. Arabia, sensu latu, loosely matches up with NE Africa and the Levant, nowhere else. For this reason, I find your suggestion that M arose east of Arabia to be the most parsimonious answer. On a side note, a few time you have speculated about back migration from Arabia to Africa in MIS 5. While visiting, Van Peer raised the same issue. We have Early Nubian Complex in Africa dated between 130 - 115 ka BP, then a long hiatus lasting until ~90 ka BP, at which time the Late Nubian Complex emerges. In Arabia, we have Late Nubian out the wazoo (186 sites to date), with that the dates from Aybut Al Auwal placing it around 106 ka BP. It is certain possible a back migration took place during MIS 5a. Finally, on the question of bottlenecks, all signs point to devastating conditions in Arabia during MIS 4 and MIS 2. Some may have survived, but I'd estimate 90% of the subcontinent became desiccated during these intervals. This is why I think the descendants of the Nubians did, indeed, survive in some form in the southern Levant. But it certainly doesn't look like they stuck around Arabia when the climate went south (ITCZ pun intended). Do we know anything about Iran/Balochistan? If Arabia and South Asia have no clear archaeological links, then what of the lands between the two? Mostly unsurveyed? Sorry to ask such a simplistic question here, but what's the difference between the two columns "Time estimate (years)" and "SD (years)"? The variants are so great! This could tie in with the discussion on the Stewart paper. I agree with Mousterian's suggestion that anatomically modern humans and behaviuorally modern humans could be different things from different origins. (the latter originating in Arabian cradle). Nice and very important paper - but I agree, the time estimates are most likely horribly off. While I am not an expert, it should be clear to anyone that the climate was extremely cold and dry post-Toba, and as such, any major migration, let alone population growth, is out of the question then and for ~20,000 years following. Before the advent of rather modern transportation and storage technologies, crossing hundreds, let alone thousands of miles of desert was an impossible feat. Instead, people migrated in climatically good times, when possible and when under population pressure. This makes ~125,000 - 110,000 ya the most likely scenario, by far. Sure, there's the possibility of further migration ~100,000 - 70,000 ya, but (i) HGs late-comers cannot really be expected to make a dent when entire continents were newly exploited before their arrival, and (ii) AFAIK there is zero archaeological evidence for it. The populating of SE Asia, including the known Denisovan admixture estimates, makes most sense if it happened before Toba. At the minimum, M expansion (not the node!) would be right after 70,000 ya - but more likely starting substantially before it. There is also an interesting bi-modal distribution of the N-substitutions, and a huge difference with respect to M. Again, the Toba bottleneck and re-populating may account for this. What is the definition of RSRS, and how does it differ from L? It's remarkable that Behar et al 's Table S1 (Suppl Mat) suggests that Africans are closer to Neandertals than non-Africans, as between the 18 nucleotides apparently common between Neandertals and modern humans, all 18 are found in Africa (L0, L1, L2, L3, L4, L5, L6), while only 10 are found outside of Africa. This is very unlikely and contradicts autosomal studies in which it's non-Africans that are closer to Neandertals. I don't think Behar et al. sorted out homoplasies and common descent between humans and Neandertals. "What is the definition of RSRS"
"and how does it differ from L?" It is a postulated pre-L haplogroup, ancestral to both L0 and L1''6. "The two main Eurasian macrohaplogroups M (~50,000 years) and N (~59,000 years)"
It's remarkable that Behar et al 's Table S1 (Suppl Mat) suggests that Africans are closer to Neandertals than non-Africans, as between the 18 nucleotides apparently common between Neandertals and modern humans, all 18 are found in Africa (L0, L1, L2, L3, L4, L5, L6), while only 10 are found outside of Africa. I don't understand your interpretation of the data. There are 18 changes with respect to Neanderthals that are not shared by the roots of L0 vs. L1-6 -- and these are roughly evenly distributed between these two branches. All it indicates is that these two branches split a long time ago, and perhaps blossomed at about the same time (which makes sense, from a climate perspective). Africans are closer to Neanderthals in mtDNA and Y-DNA because, so far, no surviving mtDNA or Y-DNA offspring of admixture have been found. That is, to a very high degree, following just these two lines (and not autosomal DNA), all extant humans derive from people who split off from future Neanderthals and future Denisovans a long time ago, and then (at one time) lived in Africa (or moved to Africa and then out - but that is less likely). "Yeah, it seems that all the major expansion dates fit nicely into climate change scenarios"
But there is a really interesting aspect that I just noticed yesterday, assuming the dates are near enough to accurate or at least relatively so. M's expansion appears to have begun in the east. The oldest is M42'74, the haplogroups shared between Australia and South China. Its expansion rapidly follows that of P to the Philippines, so perhaps there is a connection. In rapid succession we then have a series of East and SE Asian haplogroup expansions leading towards India. M32'75, M12'G, M1'20'51, M13'46'61. It is only contemporary with the last that we have M29'Q into New Guinea/Melanesia and M40'62 shared between East Asia and Orissa. The M haplogroups in Central India (M2, M3, M5, M6, M25, M35 and M39) expand surprisingly recently. The earliest being M35 at 39,000 years, long after several R expansions in South Asia and even in West Eurasia. Something funny is going on with M and the southern migration theory, unless the dates are completely wrong. "There are 18 changes with respect to Neanderthals that are not shared by the roots of L0 vs. L1-6 -- and these are roughly evenly distributed between these two branches. All it indicates is that these two branches split a long time ago, and perhaps blossomed at about the same time (which makes sense, from a climate perspective)." There are 18 identical-by-state nps between Neandertals and the roots of the two most divergent branches of modern humans. L1-6 is by 3 np closer to neandertals than L0 but since both L0 and L1-6 are found in Africa, while only L1-6 are found outside of Africa, Africans are closer to Neandertals than non-Africans. How else can we interpret the data? It's in clear contradiction to autosomal studies in which identities-by-state are detected between non-Africans or Melanesians and Neandertals or Denisovans, with the exclusion of Africans who have unique matches with chimps not seen in non-Africans. My interpretation of mtDNA is that it mutates too fast and all these matches between L0 and L1-6 and Neandertal sequences are probably homoplastic. Dziebel, your homoplasy interpretation does not make sense, as it is very strained. The most reasonable and parsimonious interpretation of the data is that the most recent common ancestor of the extant human mitochondrial lineages and its oldest branches existed in Africa, and they all date from well after the modern human-Neanderthal split. "The oldest is M42'74, the haplogroups shared between Australia and South China." The ostensibly oldest one of the two, M42, was also found in India, among the Munda. Firstly, the total number of mutations is minuscule compared to the over 16,000 base pairs - so, outside the hypervariable regions, mutations are clearly very rare. Secondly, you are looking at the relation of L0 and L1-6 with respect to the progenitor of humans and Neanderthals - not to Neanderthals directly. So, none of the two branches is closer to Neanderthals. Thirdly, there are about 150 mutations that all humans share, with respect to RNRS (or, presumably of the order of 80 or so to the progenitor). But there are only 18 that the tops of two main human branches don't share - roughly evenly distributed. That's roughly an order of magnitude (on each branch) smaller than the number of shared mutations to the progenitor. In other words, relatively speaking, the progenitor is very far away, and both branches are virtually the same distance away, as would be expected from a small initial human population. How else can we interpret the data? German, another way of illuminating this is that the number of mutations in two branches (10 vs. 8) before they branch again is really not that telling. It's just a matter of who had more surviving daughters, earlier. For example, if L1 had not survived, all of-a-sudden the L2-6 branch would have more mutations with respect to L0. You can play the same Gedankenexperiment with other Ls. "The ostensibly oldest one of the two, M42, was also found in India, among the Munda". Thanks. I didn't know that. However it seems that the Munda language is probably an early Austro-Asiatic language and so may have entered India from further east. Although M74 is 'only' 35,000 years old its ancestor must have separated from M42 at least 47,000 years ago, and M74 is South Chinese. "the number of mutations in two branches (10 vs. 8) before they branch again is really not that telling." I agree this doesn't matter much. What matters, though, is that the current phylogeny in which L0 is exclusively African and L1...L6 is shared between Africa and the rest, Africans in total have more genetic matches with Neandertals than non-Africans. Granted the number of matches is low, but, similarly, the number of autosomal matches between Neandertals and non-Africans (or between Denisovans and Papuans/Asians/South Amerindians) is small, too. You are talking about "branches" and I'm talking about the populations that carry those branches. "outside of HVR mutations are clearly very rare"
Rare, doesn't mean non-existent. It's from studies like this that we can determine whether they are homoplastic or evidence common descent. But the common descent is usually assumed but not proven. "Secondly, you are looking at the relation of L0 and L1-6 with respect to the progenitor of humans and Neanderthals - not to Neanderthals directly." It's Neandertals directly - look at Table S1, pp. 6-7 of Suppl Mat. How are these matches different from the autosomal matches between Neandertals and non-Africans? Plus I don't understand if you're saying that L0 and L1..6 split so long ago as to predate the African hominin ancestor of modern humans (under the out of Africa model). Such an ancestor, if he existed, would have made Africans completely dissimilar from Neandertals. If you think that those 18 matches between Africans and Neandertals are symplesiomorphic (not synapomorphic) with Neandertals, then it's unclear why they are split into 2 branches. German,what I mean by that is that the 150 mutations between RNRS and RSRS clearly are not just away from either humans or Neanderthals, but a (very roughly equally) shared number of mutations away from their common progenitor. What proportion exactly could probably be determined by comparing to Chimp mtDNA. 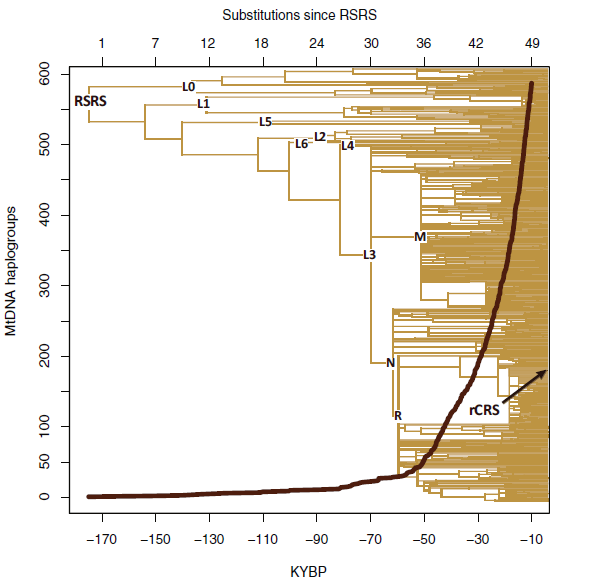 And whether RSRS is either 70 or 80 mutations away from that progenitor - either way that number is about an order of magnitude larger than the 8 vs. 10 retained retained ancestral positions in the L0 vs. L1-6 branches (and the latter are three orders of magnitude smaller than the ~16,000 other shared ancestral positions between humans and Neanderthals). And once they split, of course their differentiation is overwhelmingly with respect to ancestral positions, and we would expect some such before each line splits again. And of course these are symplesiomorphic - but they are not and cannot be used to claim closer relationship of either branch to Neanderthals, because both branches share a total of 150 mutations that already show that they far and foremost share a long history of mutating away from Neanderthals. You can't seriously claim that L0 and L1 split from the RNRS and RSRS progenitor very early on, and the large number of subsequent shared mutations are simply happenstance? Sure, here or there is one or the other rare back-mutation - but those are extremely rare (this can easily be verified) outside the HVRs and a couple of other sites - and you can build a very good tree (except some last bottom branches) excluding such sites. I did not state that, and I don't know how it matters here, but yes, I do believe that if you mean AMHs. If anything, age estimates underestimate true times, so yes, the split occurred before what most people would consider AMHs, and clearly predates culturally MHs by a long shot. I don't see how that causes any problems. "I've long thought that the evidence suggests that N is much older than M in the east, especially in Australia." It's possible that M is in fact a subset of N, as hg D5 doesn't have M-specific restriction sites and is effectively an N lineage with some incipient M features such as C10400T. "The Munda language is probably an early Austro-Asiatic language and so may have entered India from further east. Although M74 is 'only' 35,000 years old its ancestor must have separated from M42 at least 47,000 years ago, and M74 is South Chinese." "And of course these are symplesiomorphic..."
If modern humans show variation at "symplesiomorphic" sites, then those sites are not symplesiomorphic but synapomorphic. But they can't be synapomorphic for other reasons, as Africans don't share a clade with Neandertals. "I don't see how that causes any problems." Huge problems. Modern human behavior is not attested globally until 40,000, linguistic diversity, a key measure for a key modern human behavioral attribute, is the greatest outside of Africa. You don't want to argue that Khoisans that are high at L0 invented language and modern human behavior independently from other humans, do you? "It's possible that M is in fact a subset of N, as hg D5 doesn't have M-specific restriction sites and is effectively an N lineage with some incipient M features such as C10400T". Interesting idea. I await developments. All you need is that sufficient diffusion is maintained over time at the autosomal level (and/or perhaps a number of more major migration events), and one might expect that to be predominantly carried by men. Further, there is quite some evidence that mtDNA is regionally adaptive, and that selection plays a significant role in (the lack of) mtDNA variation. You other argument I don't really understand, perhaps you can rephrase. Sorry, I must have overlooked your last sentence. See, if Africans share specific sites with Neandertals (and non-Africans share a subset of those sites) and we construct a tree that's rooted in those specific sites, then these sites should be synapomorphic between humans and Neandertals, or, in other words, they need to be a product of unique evolution in the Neandertal lineage. They can't be symplesiomorphic, or in other words, retentions from a pre-Neandertal population in Africa. You can't root a tree in symplesiomorphic sites; this is not how you do phylogeny. If those shared sites are symplesiomorphic, then there shouldn't be any difference between Africans and non-Africans in the presence or absence of those sites. Africans can't be closer than non-Africans to a pre-Neandertal African population. The only way to ascertain an African origin of modern humans is to have enough sequence data from African AMH and African archaics to show that modern humans inherited a subset of unique African hominin mutations, post the Neandertal split, and that modern Africans have preserved them better than non-Africans. Rooting a human tree in a Neandertal sequence and simultaneously showing Africans (and not non-Africans) as being closer to Neandertals is trying to have the cake and eat it, too. It seems quite possible, in view of the above, that the matches between Neandertals and African mtDNA sequences are due to convergent evolution. mtDNA is highly mutable, so, with the haplotype assignment methodology, you may not have enough shared mutations to assign a non-African sequence to a Neandertal lineage (although they may still be related by descent), but randomly Africans showed a bunch of shared mutations with Neandertals, which don't form a haplotype based on identity-by-descent. This brings me to another point regarding dates: with the dates for African mtDNA divergence approaching 200,000 and with Khoisan-frequent mtDNA and Y-DNA lineages budding off very early on, it makes it rather unlikely that we're dealing here with real facts because we can't reasonably argue that Khoisans invented language and culture independently of other humans. Linguistic diversity, as measured by the number of unique stocks, is much higher outside of Africa; archaeologically, we see secure signs of modern human behavior only at 40,000 globally. There's a major discrepancy between the molecular dates and the genetic phylogenies, on the one hand, and the dates and distributions of cultural and linguistic traits, on the other. "archaeologically, we see secure signs of modern human behavior only at 40,000 globally". So Australian Aborigines are not behaviourally modern? I thought you believed that Australian megafauna was eliminated by modern humans. This makes them behaviorally modern, doesn't it? On the other hand, in Africa megafauna was largely spared: only 14% (or 7 out of 49 genera) of African megafauna went extinct in the Late Pleistocene. This must mean, if we take your anthropogenic argument seriously, that behaviorally modern humans came to Africa rather late and/or in small numbers. 'I thought you believed that Australian megafauna was eliminated by modern humans". Correct. And I believe that Australian Aborigines are 'behaviorally modern'. What I see as a problem is that the megafauna extinction in Australia is dated at 46,000 years ago. That is considerably ealier than your 'secure signs of modern human behavior only at 40,000 globally'. "On the other hand, in Africa megafauna was largely spared: only 14% (or 7 out of 49 genera) of African megafauna went extinct in the Late Pleistocene. This must mean, if we take your anthropogenic argument seriously, that behaviorally modern humans came to Africa rather late and/or in small numbers". I see no problem with that. But it still looks very much as though modern human haplogroups all derive from an African source. That could mean that the carriers of these early African haplogroups were not technically 'behaviorally modern', but other explanations are possible. "But it still looks very much as though modern human haplogroups all derive from an African source." how to definite haplogroups with their logiciel, please.